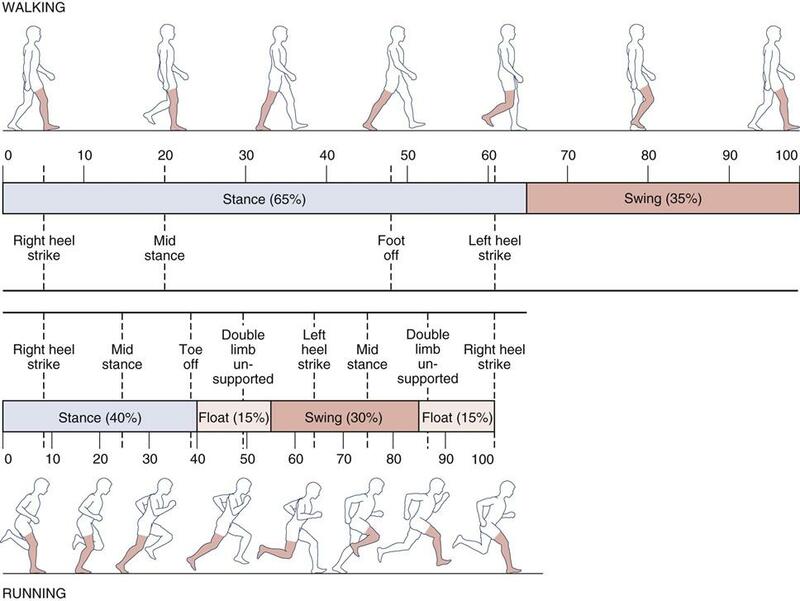 Ball vs heel strike when walking or light jogging? I've found I have two different foot usages when I walk, stride or lightly jog/run. Sometimes I touch down with the heel first. I either roll or more usually, tread/lift. Other times I extend the ball of my foot as the foot approaches the ground, and it acts as shock absorption (the heel doesn't touch or barely touches throughout). This feels like it puts less strain on the foot and heel area and is comfortable. I'm equally comfortable with all of them. What are their differences in terms of health, efficiency, impact effect, and either improved tone or adverse effect on the muscles and joints? Should I prefer any of them over another? Note on context - I'm not a runner nor a jogger; I walk a lot and stride heavily (long and fast distance-consuming stride), and sometimes lightly run/jog. Sometimes I'm carrying extra weight such as a heavy backpack or shoulder bag at the same time. So I'm not really looking at serious running or jogging fitness, more for general but ongoing all-the-time daily practices. Answers covering running are welcomed but if they are more geared to my use it would be better. Gait essentially is a transition between repeated loss of balance and recovery. During movement there is a cyclic transfer between potential and kinetic energy which will minimize the energy cost of walking. Efficient movement involves preserving and transferring the greatest amount of energy (your momentum) to help propel you forward during your next step. By sliding your feet, yes, the ground reaction force is minimized but you’re moving (and programming yourself in the future) to move inefficiently (by dragging your feet). Besides friction, the net energy cost during gait is proportional to medial, lateral and vertical displacement of the body’s center of gravity. The greater the displacements, greater the energy costs. Other considerations include width of base of support, angle of toe out, stance phase, period of double limb support, along with increasing the base of support will see an increase in the medial/lateral displacement – all of those increasing factors will serve to increase the M/L displacement of the COG which will require you to expend more energy. Contact with the ground results in one of 3 forces acting on the body during the stance phase. Vertical Forces are going to be equal and opposite, and included reactions to loading and propulsion, at mid stance these vertical forces are less than your body weight (BW). Anterior and Posterior Forces are designed to prevent the foot from slipping, at initial contact the AP force is directed post, it will peak at about 20% of the BW and is related to the bodies COG. As your foot first touches the ground, while entering swing, the forces will be directed anteriorly to help the body accelerate forward. Medial Lateral Forces tend to be smaller than other components and will vary with the base of support (medial / lateral forces are less if you walk with a small base of support because you would be getting more vertical support). Just to clarify. What part of the foot (optimally) strikes first depends upon speed - Above ~120 steps/min you can no longer increase the stride length. This marks the transition from walking to jogging/running and occurs at ~190 cm/sec. So you want to start jogging when you start to feel like you have to. Jogging too soon is similar to jogging in place (wasted effort and energy). Without going into plantar pressures and a joint by joint kinematics -- have a few days? ;) - I'll leave it there and can clarify further if needed. My other answer may be helpful to you as well. As Mike described - depends. When you walk - typically you start with hill. There are some phases like foot locking. When walking that is effective, as things developed during evolution. When running - there are different forces, and you should land on forefoot, not on hill. That should happen, when the foot is close / under your body. That way you use quads to absorb forces. All that is present on great pictures, from Mike's post. Like bended upper body when running. On the other hand - you need to be aware about that details, and realize they make difference. When to switch? Depends on your needs - if you want to burn calories, on treadmill - that is not big deal. Real challenge starts when you want to run fast, be effective. And here Mike's post comes to play. As a side note - some questions, and side comments. How long we are wearing that fancy shoes? How long we are running? Are shoes done to help or to sell better? Manufactures gives more, and more support for hills, since that makes running easier, but not necessarily better. Issue is when you get that knowledge and it is too late. Not the answer you're looking for? Browse other questions tagged jogging walking joints technique or ask your own question. Is 10,10,10 as good as 30? How can I improve walking stamina without walking? Is it ok to heel-strike while walking? What can I eat while walking? Walking/jogging/sprinting causes pain in the abdomen? Does walking, running and jogging improve the health?